PLEASE READ THESE TERMS AND CONDITIONS CAREFULLY. By using Infoblox Inc.’s (“Infoblox”) website, including, without limitation, any associated forums (the “Site”), you agree to be bound by the following Terms and Conditions. “You” refers to the person using the Site. If the Site is being used on behalf of an entity by a representative using the Site on behalf of such entity, then “you” also refers to such entity. You must be at least 18 years of age to use the Site. These Terms and Conditions apply to all use of the Site and all content available on the Site. Infoblox reserves the right to modify or terminate the Site, or to terminate your access to the Site, at any time and without notice. In addition, Infoblox may change these Terms and Conditions at any time. Access to certain areas or services available through the Site may require you to consent to additional or different terms and conditions of use. All content on this Site, including text, graphics, logos, icons, images, podcasts and video clips, is the exclusive property of Infoblox or its content suppliers and is protected by U.S. and international copyright laws. The compilation (meaning the collection, arrangement, and assembly) of all content on this Site is the exclusive property of Infoblox and is also protected by U.S. and international copyright laws. The content on this Site is for your own use as a resource. Any other use, including the reproduction, modification, distribution, transmission, republication, display, or performance, of the content on this Site is strictly prohibited. Copyright Notice. Copyright © 2012-2015 Infoblox. All Rights Reserved. The Site may include a forum for users to post content. Although some of the individuals posting to this Site, including the moderators, may work for Infoblox, any opinions expressed are the personal opinions of the original authors, not of Infoblox. The forum content is provided for informational and entertainment purposes only and is not meant to be an endorsement or representation by Infoblox or any other party or its products or services. Infoblox does not assume any responsibility or liability for any opinions or other commentary posted on this Site or any Site linked to this Site and makes no express or implied warranty or guarantee about the accuracy, copyright compliance, legality, or any other aspect of the content. This Site is available to the public. No information you consider confidential should be posted to this Site. If you submit content, Infoblox may reveal your identity and whatever information we know about you to any law enforcement agent or official in the event of legal action arising from any postings made by you. Infoblox may modify, display, delete, transmit or distribute content posted on this Site in its sole discretion and without your permission. However, Infoblox shall not be responsible for controlling or editing any content, nor can Infoblox ensure prompt removal of inappropriate or unlawful content. You also grant to Infoblox a worldwide, perpetual, irrevocable, royalty-free and fully-paid, transferable (including rights to sublicense) right to fully exercise and exploit all intellectual property, publicity, and moral rights with respect to any content you provide. By posting you agree to be solely responsible for the content you contribute, link to, or otherwise upload to this Site and release Infoblox from any liability related to your use of the Site. You warrant, represent and agree that you will not contribute any content or otherwise use the Site in a manner that (i) infringes the intellectual property rights or proprietary rights, or rights of publicity or privacy, of any third party; (ii) violates any law, statute, ordinance or regulation; (iii) you should know is harmful, threatening, abusive, harassing, tortuous, defamatory, vulgar, obscene, libelous, or otherwise objectionable. INFOBLOX, TRINZIC, GRID, NIOS, DNS FIREWALL, ADVANCED DNS PROTECTION, NETWORK INSIGHT and the Infoblox logo are trademarks or registered trademarks of Infoblox. All other trademarks mentioned in this Site are the property of their respective owners. The trademarks and logos displayed on this Site may not be used without the prior written consent of Infoblox or their respective owners. 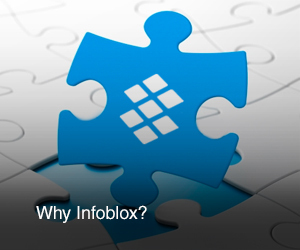 INFOBLOX PROVIDES THE WEBSITE AND ALL CONTENT ON AN “AS IS” BASIS. INFOBLOX MAKES NO REPRESENTATIONS OR WARRANTIES OF ANY KIND, EXPRESS OR IMPLIED, AS TO THE OPERATION OF THE WEBSITE OR THE INFORMATION, CONTENT, MATERIALS, OR PRODUCTS INCLUDED ON THIS WEBSITE. TO THE FULL EXTENT PERMISSIBLE BY APPLICABLE LAW, INFOBLOX DISCLAIMS ALL WARRANTIES, EXPRESS OR IMPLIED, INCLUDING, BUT NOT LIMITED TO, IMPLIED WARRANTIES OF MERCHANTABILITY AND FITNESS FOR A PARTICULAR PURPOSE AND NON-INFRINGEMENT. Although Infoblox has attempted to provide accurate information on this Site, Infoblox assumes no responsibility for the accuracy or completeness of the information. Infoblox may change the programs or products mentioned on this Site at any time without notice, but Infoblox makes no commitment to update the programs or products mentioned on this Site in any respect. Mention of non-Infoblox products or services is for informational purposes only and constitutes neither an endorsement nor a recommendation. INFOBLOX WILL NOT BE LIABLE UNDER ANY THEORY OF LAW, FOR ANY INDIRECT, INCIDENTAL, PUNITIVE OR CONSEQUENTIAL DAMAGES, INCLUDING, BUT NOT LIMITED TO, LOSS OF PROFITS, BUSINESS INTERRUPTION, LOSS OF INFORMATION OR DATA OR COSTS OF REPLACEMENT GOODS, ARISING OUT OF THE USE OR INABILITY TO USE THIS WEBSITE OR ANY INFOBLOX PRODUCT OR RESULTING FROM USE OF OR RELIANCE ON THE INFORMATION PRESENTED, EVEN IF INFOBLOX MAY HAVE BEEN ADVISED OF THE POSSIBILITY OF SUCH DAMAGES. For information on Infoblox’s terms and conditions of purchase, please review the Standard Terms and Conditions of Purchase. Not all products or programs mentioned may be available in your country. Please contact your local sales representative for information as to products and services available in your country. This Site may contain links to third-party websites. Access to any other Internet website linked to this Site is at your own risk and Infoblox is not responsible for the accuracy, availability or reliability of any information, goods, data, opinions, advice or statements made available on these websites. As such, Infoblox is not liable for any damage or loss caused or alleged to be caused by or in connection with use of or reliance on any such third party website. Infoblox provides these links merely as a convenience and the inclusion of such links does not imply an endorsement or recommendation. The information contained in the Infoblox Documentation Website (docs.infoblox.com) may not be copied or duplicated in any form, in whole or in part, without the prior written permission of Infoblox, Inc. The information in docs.infoblox.com is subject to change without notice. Infoblox, Inc. shall not be liable for any damages resulting from technical errors or omissions which may be present in docs.infobox.com, or from use of its content. These Terms and Conditions and other rules, guidelines, licenses, and disclaimers posted by Infoblox in connection with the Site constitute the entire agreement between Infoblox and you with respect to your use of the Site and content therein. The formation, construction and interpretation of these Terms and Conditions will be controlled by the laws of the State of California as if made between California residents entered into and to be performed within California, and giving no effect to its choice of law provisions. The U.N. Convention of Contracts for the International Sale of Goods is expressly excluded from any interpretation of these Terms. The Uniform Computer Transaction Act as adopted in some States in the United States of America will not apply. Any dispute relating to these Terms and Conditions will be subject to the exclusive jurisdiction of the state and federal courts in Santa Clara County, California, U.S.A., and the parties agree to submit to the personal and exclusive jurisdiction and venue of these courts. The Site is created, controlled and operated by Infoblox in the State of California, USA. If any provision of these Terms and Conditions is held to be unlawful, void or for any reason unenforceable, that provision will be deemed severable from this agreement and will not affect the validity and enforceability of the remaining provisions. If you have any questions concerning these Terms and Conditions, or if you desire to contact Infoblox for any reason, you may call Infoblox at (408) 986-4000, fax (408) 986-4001, or write: Infoblox Inc., 3111 Coronado Drive, Santa Clara, CA 95054 USA. https://www.infoblox.com.